With modern football taken over by prize money and chequebook managers, the history of today’s not-as-beautiful-as-it-used-to-be game is more important than ever. Football started before the internet, the Premier League and Sky Sports. The game was once steeped in tradition, and the people who played were at one with the people who watched. 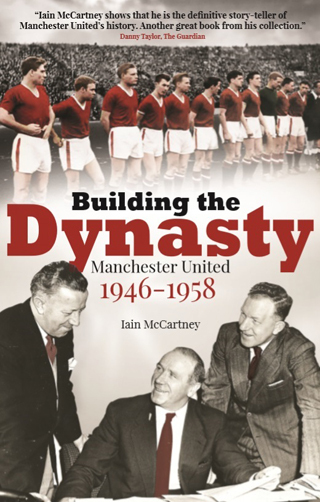 Building The Dynasty: Manchester United 1946-1958 is written by lifelong Manchester United supporter and collector Iain McCartney. And he delves in to the history of the red side of Manchester to tell a compelling story of how a team was built. The Busby Babes are, to many, where the Manchester United tradition began. Terrific flowing, attacking football, and a side who came to their demise far too soon through tragedy. But this group of players didn’t just appear. There were ten years of hard work and engineering by Matt Busby and Jimmy Murphy that created such an important part of Manchester United’s history. And Building The Dynasty: Manchester United 1946-1958 tells that tale. How they took over what was a normal club, with not much money in the coffers – and how they turned them in to arguably the best football team of its time in world football. McCartney details the huge challenges the two faced after taking over the club after the war. The fact that they had no ground due to bomb damage, that Busby was an unknown in management circles, and that he had a team of run-of-the-mill players. But what I really like about Building The Dynasty is that it doesn’t just skim over the historical surface. We dig deep in to conversations, financial reports and newspaper clippings that encapsulate what Busby was looking to achieve, and how he got there. The earlier years saw the club win an FA Cup in 1948, and the league title in 1952. But as McCartney points out, everybody knew that it was an ageing side that had just won the title, and that changes needed to be made. And this is where the book really kicks in, and the legacy that Busby built enters a whole new different dimension. Busby barely made another a transfer again as the likes of Eddie Colman, Roger Byrne and Bobby Charlton came through the youth ranks at Old Trafford. ‘Sow and Ye Shall Reap’ is a perfectly titled chapter. Building The Dynasty: Manchester United 1946–1956 introduces you to the youngsters over the course of the story almost in the same way the fans were introduced to them over time in the fifties. A poignant part of the tale that McCartney writes about is an eight-goal thriller in the FA Cup Third Round, when United played away at Burnley in 1954. They lost 5-3, but a match report from the time stated that United didn’t lose by fielding five youngsters; the boys were let down by men. 17 year old Duncan Edwards was labelled the bravest man on the field. With the team’s tragic demise in 1958, the book touches on the air disaster at the end. It has to, but it leaves it there. Building The Dynasty is about triumph, and I like that you can finish the book without feeling sad, despite an unhappy ending. There’s near enough 320 pages of history in this publication. And because of the detail it’s easy to put down when you’ve ended a chapter, but you’re excited to pick it up again too. It’s a book that any Manchester United supporter with the history and traditions firmly embedded in their heart will cherish. Kids who want to learn about the club will be better educated by putting down the internet and reading the book too. A very good, thorough read by one of Manchester United’s most important documentarians.